Fuel-efficient and environmentally-sustainable premium automobiles from Mercedes-Benz, without the need to forego the characteristic brand features - safety, comfort and refined driving pleasure. This is the strategy of the Stuttgart based vehicle manufacturer. One emphasis within the development strategy is on modular powertrain technologies that can be utilised either individually or in combination, depending upon vehicle class, usage profile and customer requirements. With its “Road to the Future” Mercedes-Benz has presented details on the product implementation. Mercedes-Benz offers a tangible outlook into the future of the combustion engine with the innovative DIESOTTO engine in the research vehicle F 700. World population, and thus the need for individual mobility, is set to grow drastically over the next few decades. At the same time, natural resources are becoming increasingly scarce as well as consequently more expensive for both consumers and vehicle manufacturers. Add to this, legislative requirements for the environmental sustainability of vehicles differ dramatically from region to region across the globe. For example, many European cities have now established environment zones and the state of California has legislated quotas for zero-emissions vehicles. These developments are already having a noticeable impact on customer behavior. Alongside economic factors - primarily increasing fuel prices - the environmental sustainability of vehicles is gaining importance in the purchasing decision. Everyday customer requirements are becoming increasingly differentiated and more individualised - those who drive long distances cross country have different vehicle requirements than those who travel largely or exclusively in and around congested urban areas. Therefore, Mercedes-Benz is convinced that, in the future, one single technology will not prevail on the road to sustainable mobility. Instead, to these multi-faceted demands the company is offering equally multi-faceted individually tailored solutions. The benefits of individual technologies in respect of optimal fuel consumption and emissions values are played to their best advantage in specific fields of application. The approach taken by Mercedes-Benz as a premium manufacturer is therefore based on vehicle concepts with modular powertrain technologies that ensure that both customer benefit and environmental sustainability always take centre-stage for the brand with the highly regarded three-pointed star. Optimisation of vehicles with the very latest combustion engines - such as downsizing, petrol direct injection, turbocharging and BlueTEC - as well as specific vehicles optimisation initiatives in areas such as aerodynamics, lightweight design and energy management (BlueEFFICIENCY). Further efficiency improvements via individually tailored hybridisation in a number of stages - from the start/stop function through to the Two-Mode hybrid with full electric drive capability. Zero-emissions driving with fuel cells and battery-powered vehicles. Furthermore, the company is also pursuing the development of clean and alternative fuels that do not present a competitive threat to food crops - one particular example being SunDiesel made from waste plant material. Development engineers have devised individual packages tailor-made for each vehicle segment. The objective is to find the best solution for each individual vehicle model. Under the BlueEFFICIENCY label, Mercedes-Benz has developed a package of various fuel economic measures, which will be rolled out through the entire Mercedes-Benz model range. It encompasses optimisation of weight, aerodynamics, rolling resistance, energy management and powertrain. A good example of this is the Mercedes-Benz C 180 KOMPRESSOR equipped with a four-cylinder petrol engine. While its predecessor had a capacity of 1.8 litres, the engine displacement in the new model has been reduced to 1.6 litres. While power and torque output have been maintained at the same levels (156 hp, 230 Nm), fuel consumption has been reduced by 0.9 litres to 6.5 litres per 100 kms, in combination with other initiatives such as the new electric ECO steering system and decreased rolling resistance. The CO2 emission rate is down by over 20 grammes per kilometre - from 177 to 156 grammes per kilometre. Overall, BlueEFFICIENCY initiatives can reduce fuel consumption by up to twelve per cent. The potential of such initiatives shows the fact, that when it comes to fuel savings - in Germany, the C 180 KOMPRESSOR and the C 200 CDI hold a combined share of C-Class sales of 25 percent. It is the stated objective of Mercedes-Benz to make petrol engines as efficient as diesel engines, and diesel engines as clean as petrol engines. With the highly efficient BlueTEC exhaust gas treatment system, Mercedes-Benz has already made the diesel as clean as the petrol engine and thus proven the future viability of the self-ignition engine. When it comes to fuel consumption, the latest diesel technology is currently the best option for large sedans and SUVs. This is demonstrated by the success of the E 320 BlueTEC, with which Mercedes-Benz launched the renaissance of the diesel powertrain for passenger vehicles in the U.S. market in October 2006. This year will see three Mercedes-Benz SUVs follow suit, equipped with the world’s cleanest diesel technology. The R 320 BlueTEC, the GL 320 BlueTEC and the ML 320 BlueTEC represent a further milestone in the U.S. diesel offensive. In March 2008, Mercedes-Benz became the first manufacturer in the world to achieve registration approval in all 50 states for Diesel SUVs. The preferred methods for improving the efficiency of the petrol engine are for example reduction in displacement - downsizing - and turbocharging. As demonstrated by the C 180 KOMPRESSOR, fuel savings can be achieved without loss of performance. Fuel consumption can be further reduced and power output increased through the application of second-generation petrol direct injection. The E 350 CGI consumes 8.7 litres per 100 kilometres, which is ten per cent less than the otherwise identical 3.5 litre V6 petrol engine with port injection, in spite of its 20 hp higher power output. This technology will be implemented gradually in all petrol engines. Further potential for the increased efficiency of combustion engines can be realised through hybrid technologies. As early as next year, Mercedes-Benz will launch two petrol hybrids. In the U.S., the ML 450 BlueHYBRID will be the most fuel-efficient SUV available - equipped with a Two-Mode hybrid that can also be driven powered purely by electricity. This hybrid variant is particularly suitable for SUVs and enables fuel savings even in long-distance driving. Also next year, the S 400 BlueHYBRID will set a new standard in the luxury class. With only 7.9 litres fuel consumption in the NEDC, it is the world’s most fuel-efficient vehicle in its class. In parallel, Mercedes-Benz is offering a needs-based solution for smaller vehicles. Crucial to the choice of the hybrid module are the real-life usage patterns namely the actual everyday driving profile and the cost/benefit relationship. This is why Mercedes-Benz opted to introduce the smooth ECO start/stop function in the A- and B-Class - a system that had already proven itself in principle in the Smart Fortwo micro hybrid drive, and was further developed for the A- and B-Class. According to Mercedes experts, clean diesel hybrids currently present the greatest fuel-saving potential within the larger vehicle segments. The BlueTEC HYBRID technology is a highly efficient powertrain system that Mercedes-Benz will bring to series production. The latest study vehicle from Mercedes-Benz, the Vision GLK BlueTEC HYBRID, offers a concrete perspective on this technology. This concept study is equipped with the all-new OM651 four-cylinder diesel. Paired with a compact hybrid module, the diesel/electric drive assembly has a combined power output of 165 kW (224 hp) and a combined torque of 560 Nm - a figure that is on par with large-displacement V8 petrol engines at the top of the compact SUV segment. The refined driving performance of the Vision GLK BlueTEC HYBRID comes with an extremely low fuel consumption of only 5.9 litres per 100 kilometers. The benefits of low-emission petrol engines and the fuel consumption advantages of modern diesel engines are brought together in the DIESOTTO engine developed by Mercedes-Benz. It combines an all-new kind of compression ignition with other technologies such as direct injection and turbocharging. An additional hybrid module is integrated within the F 700 research vehicle. As a result, the F 700 offers the high performance of a petrol engine (175 kW/238 hp plus 15 kW/20 hp) and the superior torque of a diesel engine (400 Nm). Yet, the research vehicle consumes only 5.3 litres of conventional petrol per 100 kilometres and emits only 127 grammes of CO2 per kilometre, which is extremely low for a vehicle in this class. In parallel to hybrid concepts, Mercedes-Benz is working intensively on solutions for purely electric driving using fuel cells and batteries. Electric drives are particularly quiet, highly efficient and have zero local emissions. Since 1991 the company is doing research in the field of fuel cell technology and therefore has a broad experience in electric driving. These cognitions can be gainfully used for the development of battery vehicles as well. Since 2007, the Stuttgart vehicle maker has been operating a battery-powered test fleet comprising 100 Smart Fortwo electric drive vehicles in London. As a zero-emissions vehicle, the Smart Fortwo electric drive enjoys tax advantages and is exempt from local restrictions - such as the controversial congestion charge levied in the British capital. This makes it an interesting and environment-friendly alternative, especially within urban areas. But the success of innovative drive concepts is directly linked to the allocation and availability of corresponding infrastructures. Thereby a much more intensive collaboration between energy companies, petroleum industry and politics together with automobile manufactures is needed. 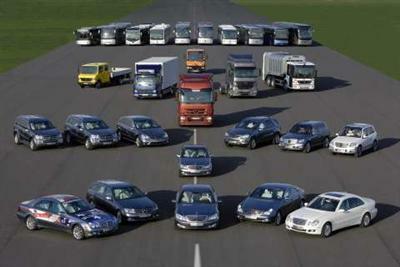 Mercedes-Benz is also a leader in the field of fuel cell technology. Mercedes-Benz has at its disposal the world’s largest customer test fleet, and will begin with a small-scale series production in 2010 of the B-Class F-Cell, featuring the next-generation fuel cell drive. This new generation has a considerable higher output, while at the same time being more compact. It is capable of cold-start at temperatures as low as -25 degrees Celsius, has a significantly greater range of up to 400 kilometres and also boasts short refueling times. The key to all forms of vehicle electrification is the energy storage unit - from hybrids to pure electric driving with fuel cell and battery vehicles. Compared with other types of batteries, lithium-ion technology offers considerable advantages, including very compact dimensions, much greater power output, a long life cycle and a high level of reliability. The future will see Mercedes-Benz use lithium-ion batteries also in battery-powered and fuel cell vehicles. Mercedes-Benz engineers achieved the breakthrough in this field through patented technological solutions. In 2009 Mercedes-Benz as the world’s first manufacturer will introduce a passenger car with lithium-ion battery to market - the S 400 BlueHYBRID. The development of fuels and powertrains is inseparably linked. High quality and alternative fuels can release further potential in the reduction of fuel consumption and emissions. For Daimler, the most promising option among regenerative fuels for combustion engines is second-generation biofuels - BTL (Biomass To Liquid) such as SunDiesel. This, so called, SunDiesel is an extremely pure, completely free from sulfur and aromatics fuel, which emits very few pollutants under combustion and is virtually CO2 neutral. The synthetic fuel is derived from the atomisation of biomass from a variety of biogenic ingredients and waste material, meaning that it does not represent a threat to food crops. Furthermore, SunDiesel can be used in current and future diesel engines without any need for modification. The transportation and storage of SunDiesel also requires no modification to the existing fuel infrastructure. In early 2002, together with CHOREN, Daimler began to investigate usage opportunities for BTL, as well as its economic feasibility and energy balance. Since 2003, the company has been testing the fuel in its vehicles under everyday driving conditions and was able to confirm the advantages of its use in diesel engines. Daimler AG has had a shareholding in CHOREN Industries since 2006. Mercedes-Benz has already brought a large number of customised technological solutions to market that meet the demands of the future. The latest examples are the BlueEFFICIENCY versions of the A- and B-Class with ECO start/stop function, and the B 170 NGT. The modular powertrain mix - from of state-of-the-art combustion engines with BlueTEC or direct injection with and without hybridisation to local emission free battery and fuel cell vehicles - also offers all the prerequisites for long-term, need-based and individually tailored mobility for Mercedes-Benz customers, at the high levels expected from the brand.